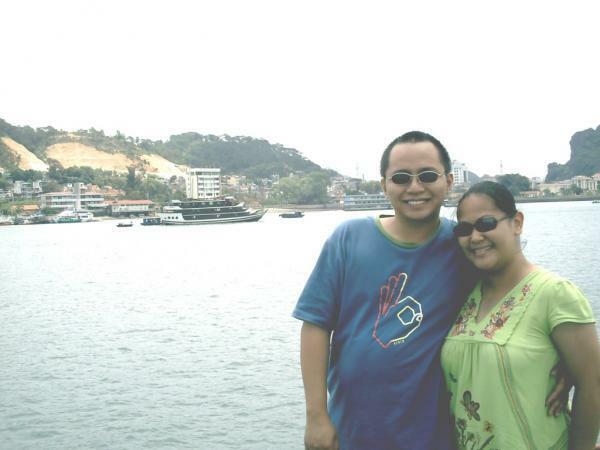 > That’s hubbie and me both excited and ready to spend moolah at Halong Bay, Vietnam. We heard rumors that shopping in Vietnam is great for they have nice stuff and are all good deals. And hubbie was in high spirit because of the rock formations that we saw at the dock. But this was a total nightmare. When we disembarked the cruise ship, we immediately looked for a money changer and eager to go shopping. As it was so humid, hubbie and SIL bought a bottle of juice each to a sidewalk vendor. She charged them 50,000 dong each. WHAAATTTTT???? For a bottle of juice and from a sidewalk vendor? That was 100,000 Dong. To be sure we were not being taken advantaged, I went to a coffee shop inside the mall direclty across the vendor. A cup of coffee costs 8 Dong, Frappe 18 Dong and bottle of water 5 Dong. That was it, I was mad at the vendor and demanded for our change. At first she was hand gesturing for us to go away. I was so mad I was speaking in Tagalog yelling at her. What the heck? She doesn’t understand English anyway. I asked her fellow vendor how much she sells the same juice, and told me it was 5 Dong. I was furious and yelling POLICE POLICE at the vendor’s face. Turns out there were no POLICE at the market. NO security guard at the mall. And we were just dismissed by the other locals. To think that this was supposed to be a TOURIST SPOT and a TOURIST SHOPPING CENTER!!! I am not one to back down on situations like this, no ma’am. It was clear she wasn’t giving the money back and so Hubbie got one of her display bottles and told her (and gesturing as well) he would smash all her displays if she won’t give the money back. I did the same. I picked two bottles and was ready to smash them on the floor. The vendor automatically got 2 50,000 paper bill from her pocket and gave them to me. And was demanding for a 10 Dong. I gave her 15 DOng. 10 for the juice and 5 for the bottle hubbie smashed as we left. It was really a night mare. I hyper ventilated. Hubbie’s blood pressure went up. SIL cursed ( as I did too). Remember that SIL is a minor (12). It was really awful. The locals didn’t even help us. They knew what was happening since they saw it all from the start. To calm our nerves, we went shopping. It was again, disappointing. The goods were too expensive. The clothes were not cheap and I could find better items at GH and Divisoria! It was totally a waste of time, money and effort!!! So people, don’t go there. Learn from our experience. Even their cave excursion doesn’t have a WOW factor. travel wisely my friend. Read from reviews and learn from them. Also share your experiences, specially the bad ones to warn others. >I tend to read reviews, and if 70 people out of 100 said it's not so good, then I stay away.I read tons of review before picking up a hotel to stay in SF when my daughter and I went on a vacation. It's worth the research. >Internet is really a big help in saving us nightmares on our trip. It's supposed to be a vacation. >Tina: yes it was bad and the smashing of the bottle was to show and prove how bad it was.